DURHAM, N.C. (WTVD) -- Durham police still need help identifying a man who drove through the doors of the Streets at Southpoint mall and robbed Fink's Jewelers earlier this month. It happened on Dec. 1 around 5:30 a.m. The suspect drove a stolen white and red pickup truck into the mall and through the entry of the store. Newly released video shows the moment it happened. 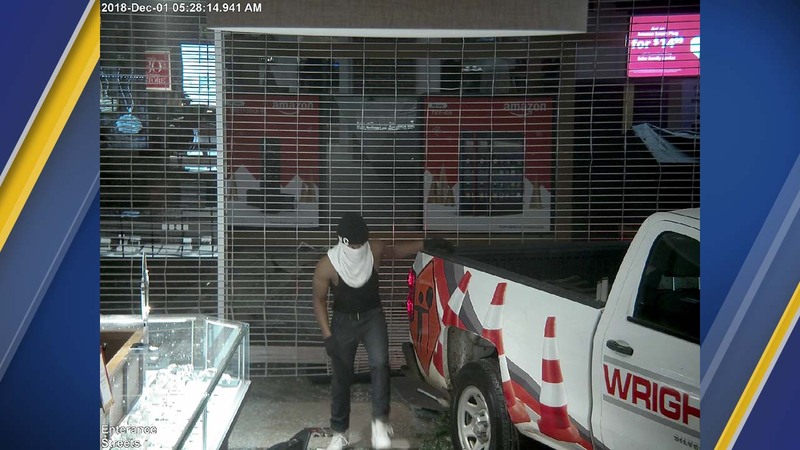 Once identified, the suspect will be charged with felony breaking and entering and larceny in connection with a smash and grab burglary. Durham police say this man drove into and robbed Fink's Jewelers at The Streets of Southpoint mall early Saturday morning. It is unknown how much jewelry was taken. Anyone who believes they may recognize the suspect in the surveillance photos or who has other information that might assist the investigation of the case is asked to call CrimeStoppers at (919) 683-1200. CrimeStoppers pays cash rewards for information leading to arrests in felony cases and callers never have to identify themselves.